”In information overload society, people face a virtual tsunami of data all day long." ”In this setting, recognizable and simple services win,” Bo Harald explains the future of banking services. ”Danske Bank has a new, somewhat similar service: MobilePay,” explains Häll. He presents a smartphone application, with which you can transfer money to anyone’s account without any other information apart from the person’s phone number. ”We are going to experience a payment revolution. MobilePay is built upon existing banking infrastructure; money is transferred between banks, just as if you were to pay a bill online from Danske Bank to Nordea. The service has three simple features: paying with a phone number, requesting a payment with a phone number and sharing a bill with phone numbers. A good bank service helps customers create value. MobilePay does that,” Häll underlines. New banking services are making commercial trade cheaper both in online and traditional stores. Bo Harald explains how mobile services will soon be competing with credit card payments. ”With this kind of payment, the merchant’s bookkeeping will be updated automatically. The merchant’s VAT reports, cash flow prediction, and reporting tools will also be updated in real time. As these services develop, customers will have their own bookkeeping automatically updated as well. Micro entrepreneurs will probably get this service first and individual clients will soon follow,” Harald predicts. 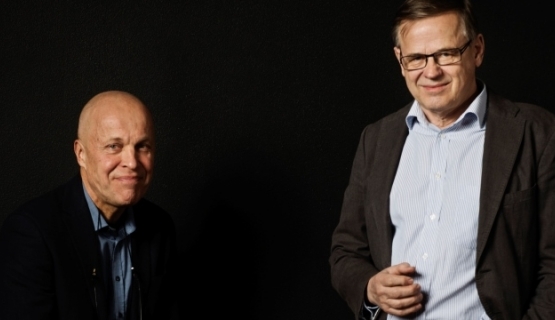 Finland’s banks were once world leaders in banking services, and these extremely simple, real time, customer driven services which Harald and Häll describe can help push Finland’s banking sector right back to the top. Häll adds one more element to the vision: the death of the traditional bank branch office. ”We used to rewards customer service personnel when they lured customers into the bank or sold specific products. I am glad this is no longer the case,” Häll says. Häll hopes that the next thing to go will be the traditional network of bank branch offices. He knows that for many customers, it makes no difference where the nearest bank office is. The distance to a bank is measured in service speed and expertise, not kilometers. In fact, the next generation will not understand the concept of a bank robbery, for the idea of a branch office full of cash will be absurd. ”A time of light offices is coming. Soon pop up branch offices can be set up and down in a day. Vaults and cashier services will be history,” Häll describes. Häll emphasizes that for Finnish banks business models are a competitive asset, which can help them back to the sharpest edge in banking business. ”I claim that the banking sector’s reason for existence is responsibility. Banks are responsible for ensuring monetary flow. Banks are responsible for giving loans to customers with the means to pay back – and not lending too much too easily,” Harald says and reminds that improving the productivity of society can also be seen as a responsibility banks hold.